With hemodialysis treatment records for which associated lab data is available, the dialysis efficacy parameters of KT/V, URR and PCR are automatically calculated and registered in the hemodialysis treatment record, usually the next day. One of several algorithms may be used to calculate KT/V, and custom KT/V algorithms may be added by qualified cyberREN users themselves to the cyberREN Calculations Catalogue. The calculation is fully automatic, and is triggered by the receipt of a new BUN/Urea lab result. The calculation draws on patient treatment data which has already been charted in the Hemodialysis Treatments section of the medical record. 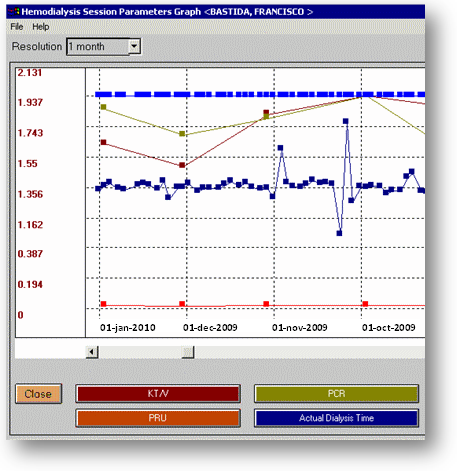 The results of the calculations is shown graphically with related results such as dialysis time as illustrated on the right, or in a tabular format, for example in an Excel spreadsheet. Prediction: in completing a hemodialysis order, the physician may take advantage of a KT/V predictor, which will suggest the achievable KT/V value based on blood flow rate, patient weight and other order parameters as well at the attributes of the dialyzer chosen. The clearance information in the Dialyzer Catalogue must be completely defined for the KT/V predictor to yield accurate results.